Widespread throughout Brunei. Elsewhere throughout Borneo and Peninsular Malaysia. 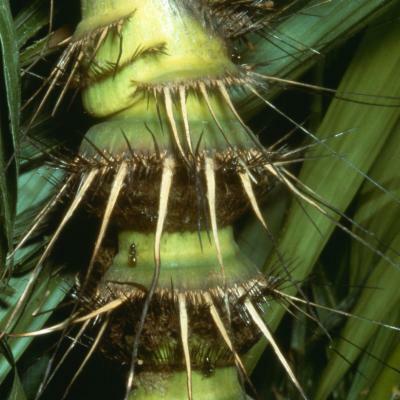 Clustering moderate-sized rattan climbing to 40 m; stem without sheaths c. 15 mm diam., with sheaths to 30 mm diam., internodes to 15 cm long. 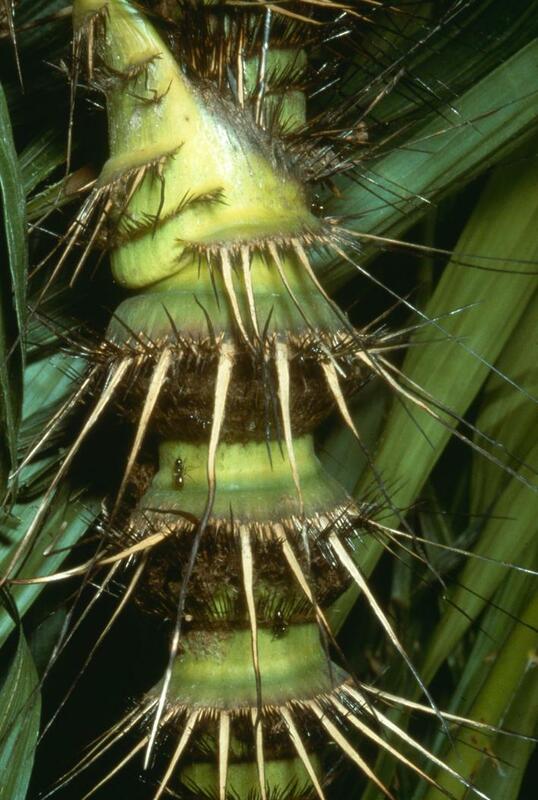 Sheaths bright green, bearing complete and partial collars to 10 mm, tipped with black and brown horse-hair-like spines, 1-6 cm long, the longesttending to be paler in colour and all bearing abundant dark grey, caducous indumentum, at least some of the collars interlocking to produce ant galleries; knee conspicuous, usually less heavily armed than the sheath. 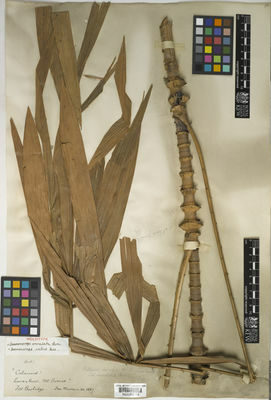 Leaf cirrate, to 2.5 m long including the petiole to 40 cm and the cirrus to 1 m; petiole armed near the base with low collars bearing black spines, distally with scattered or grouped triangular spines; leaflets very variable in arrangement, to c. 20 on each side of the rachis, rarely subregular, usually grouped in 3’s to 6’s, the basal 2 groups being congested and the leaflets pointing in several directions, the longest usually the most basal, to 40 × 2.5 cm, unarmed except for short marginal bristles. Inflorescences pendulous, to 60 cm long, primary bracts densely armed with fine black spines, all except the prophyll quickly falling at anthesis, other bracts inconspicuous. Mature fruit ovoid, very shortly beaked, c. 16 × 12 mm, rarely spherical, covered with 14-17 vertical rows of yellowish-brown scales. Seed c. 12 × 9 mm; endosperm deeply ruminate. Seedling leaf with divergent leaflets. (Fig. 23, Pl. 4B). Produces a good quality cane.